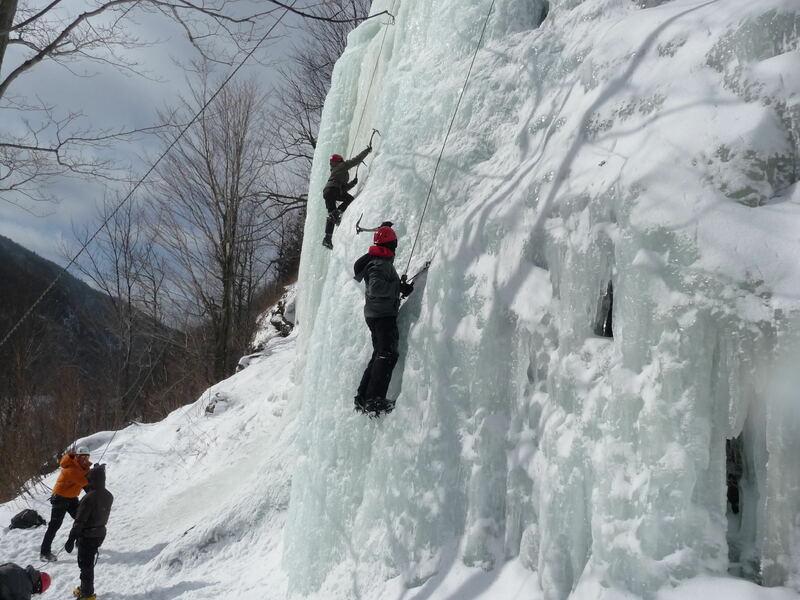 Ten Mile River – A Memorable Outing in a Winter Wonderland! 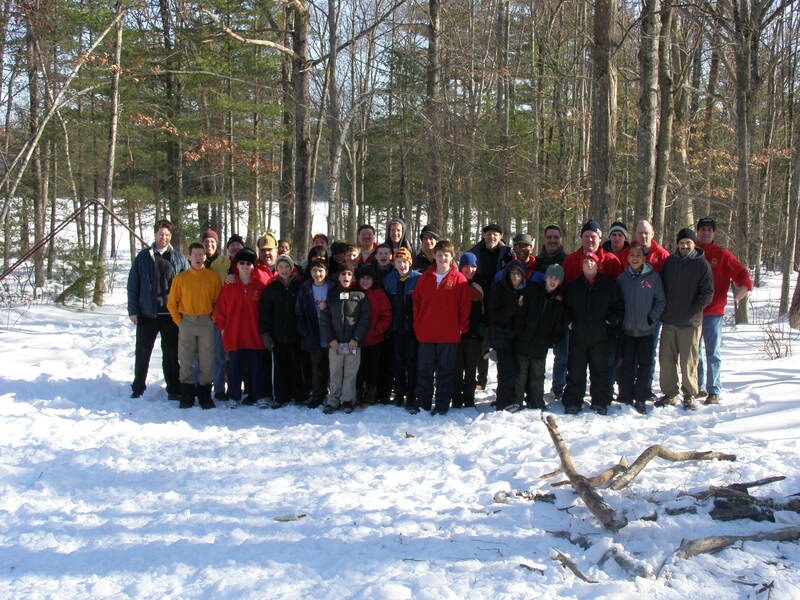 One of the troop’s long-standing traditions is to travel up to Ten Mile River Scout Reservation in the middle of the winter and enjoy a variety of outdoor recreational activities. In addition, the Old Goat patrol historically prepares a large Thanksgiving-type dinner for everyone on Saturday night. This year, the turnout was exceptionally strong, especially among the Old Goats, and all bunks were filled in both Hearst cabins. Given that it was Super Bowl weekend, the event organizers were particularly pleased at the maximum capacity crowd! Nearly half the troop arrived late Friday night. And those that did, were able to put together a solid 1-mile orienteering course the next morning in the brutally cold surroundings. The rest of the troop arrived mid-morning on Saturday and promptly prepared an early lunch in anticipation of spending the early afternoon ice fishing with long-time associate & local resident Mr. Ray Evans. Mr. Evans has taught our scouts to ice fish over the years and generously brings lots of fishing gear, bait and, of course, a large augor to punch a hole in the ice atop of the frozen lake near the Hearst cabins. This year, perhaps due to all the foot traffic on the surface, the fish appeared a bit more spooked and nobody landed any fish, or to my knowledge, even received a nibble! Still, it was a very neat experience and the scouts enjoyed immensely the fishing challenge as well as uniqueness of the frozen lake surface! 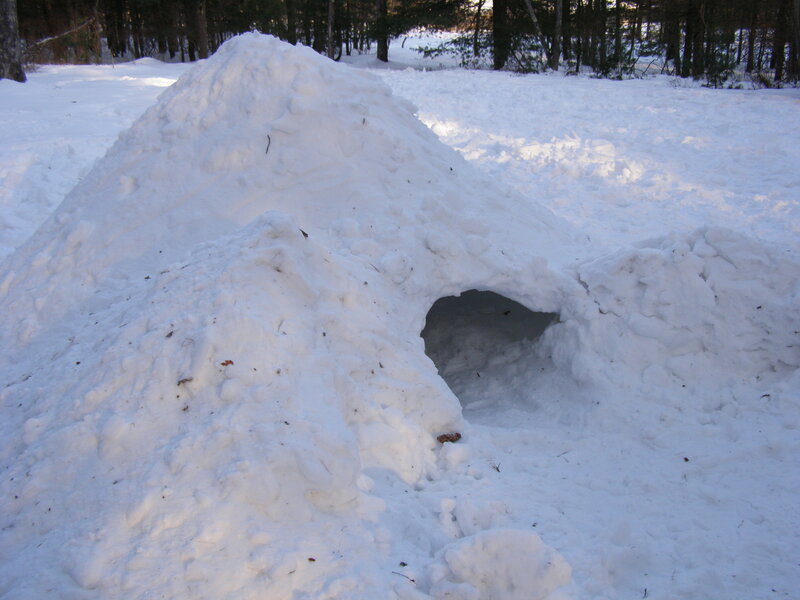 About 3 hours before sunset, the troop returned to shore and grabbed their shovels and began building quinzees, or snow huts. This entails shoveling a giant mound of snow about 6 feet high and 10 feet across. After the snow settles for an hour or two, the hollowing out process begins. Building a quinzee is a valuable skill to learn about wilderness survival. This last step takes quite a while and one gets very wet, unless properly protected with waterproof clothing. By dinner time, 3 large quinzees were built and ready for use. After consuming an estimated 60 lbs of turkey, which was deliciously prepared in large fryers, cleaning up and enjoying a short skit night, nearly everyone was ready for bed by 10pm. Five adventurous campers decided to leave the warm confines of the cabin and venture back outside to the sub-freezing night time temps in order to sleep in the quinzees. Inside the dense snow huts, it was a balmy 32–33 degrees, while outside the frigid arctic air was closer to 8–10 degrees. Everyone in the snow huts remained comparatively warm all night and enjoyed a more “peaceful” night of sleep than the 40 cots of exhausted scouts and scouter dads that were sawing seriously logs all night long! After a delicious traditional Irish breakfast and Interfaith Prayer Service the next morning, the boys packed up and were home well in advance of the Super Bowl pre-game show. In many ways, it was a truly unforgettable weekend for all! Check out the many great pictures from an unusually memorable winter campout here! Author scoutmasterPosted on February 10, 2009 May 24, 2009 Categories Activities, Advancement, Camping, Events, Photos, Ten Mile River, Winter CampingLeave a comment on Ten Mile River – A Memorable Outing in a Winter Wonderland!